Machine maintenance is essential for longevity, and one of the most basic types of maintenance is proper lubrication. Many people think that lubricating something is just for the purpose of making it more “slippery”, and while that’s not far from the truth, there are numerous other advantages to lubrication and using the right lubricant. It helps reduce friction, resulting in less machine wear during operation, minimising corrosion, reducing operating temperature and helping keep contaminants at bay. Lubricant grease has many properties that can be matched and mixed to meet your specific operating needs. For instance, there are different chemicals you can add in order to allow your machinery to efficiently operate at extreme temperatures. By looking at the machine’s demands, you can properly identify the ideal type of lubricant grease that is best suited for the machine’s proper function. But in order to understand what lubrication is, you need to first understand why it’s used. Friction is basically the force that resists relative motion between two contacting bodies. If there’s no friction, things won’t stop moving. Simply put, we need friction to function, but there are situations where you want to reduce the amount of friction. To visualize this, rub your hands together, and you’ll notice that you’ll create heat. Now imagine rubbing your hands together thousands of times a minute – the heat produced would significantly increase. Your machinery generates heat in a similar fashion and if you don’t lubricate it properly with the right lubricant, it may break down. All lubricants feature base oil, whether it’s synthetic, vegetable or mineral. For industrial applications, synthetic and mineral oil are the most popular choices. Mineral oils are graded based on their refining process, and different applications require different quality. Synthetic oils, on the other hand, are man-made, and their properties are predictable. In most cases, mineral oils are as good as synthetic oils, but synthetic oils can be more expensive, soluble, incompatible and hazardous. However, there are additives that are used with the oils in order to improve the lubricant’s performance. The most common ones are dispersants, which help protect against abrasion; antiwear and extreme pressure additives, which help prevent metal-to-metal contact and act as a thin protective layer and a thickener (a complex or simple soap made of long fibers that have a buttery, smooth texture). 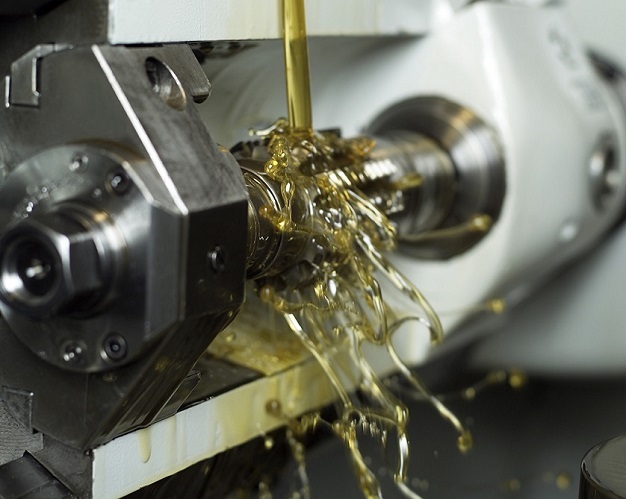 Now that you have some basic understanding of the importance of lubrication and using the right lubricants, you can clearly see the many benefits of it for machine maintenance – longer life, higher efficiency, and better reliability.